It’s been a while. My last hike was back in November 2016. Then a series of motorcycles issues along with a crazy work schedule kept me away until now. Boy, have I missed it. Making it to the top of Windham High Peak this weekend made me realize, “Don’t forget about this!” This wasn’t a difficult hike by any means but it was exhilarating, nonetheless—away from urban life and basking in the fresh air of nature. Arriving at the Peck Road parking lot for the ascent of Windham High Peak in the Catskill Mountains. Entering the yellow Elm Ridge Trail from the parking lot. Don’t forget to sign the register. Hitting the junction of the blue Escarpment and yellow Elm Ridge trails. After a while, the hike up Windham Hgh Peak becomes much rockier and rooty. Nearing the summit of Windham Hgh Peak. That’s Blackhead Range in the background. At the 3500 feet marker on the way to the top of Windham High Peak in the Catskill Mountains. 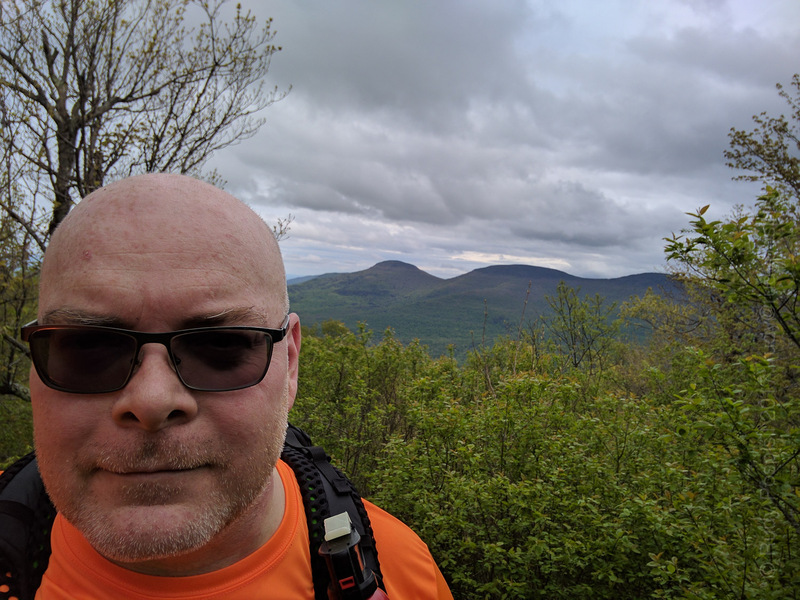 Your’s truly, near the summit of Windham High Peak in the Catskill Mountains. That’s Blackhead Range in the background. Looking over the valley from Windham High Peak. Topographic map showing the ascent of Windham High Peak in the Catskill Mountains. Google Earth map showing the ascent of Windham High Peak in the Catskill Mountains. Elevation graph showing the ascent of Windham High Peak in the Catskill Mountains. Lots of rain the night before made for a slippery descent of Windham High Peak. Setting up camp at 2,850 feet on the way back down from Windham High Peak. On the bike and heading back home to Manhattan, I passed Kaaterskill Falls and had to stop and take a picture.